Quesnelia, subfamily Bromelioidiae, was established as a genus by Gaudichaud in 1842 and is named for a French consul to French Guiana, M. Quesnel, who introduced the genus to France in 1840. Quesnelias bear a strong resemblence to aechmeas and billbergias and indeed some were earlier classified as billbergias. Although quesnelias are tough plants, easy to grow and bloom readily, the family has not become popular as houseplants, perhaps because the foliage is not particularly attractive, the inflorescences do not last long, and many of species are rather large and prickly. Nonetheless there are a few small ones (Q. humilis, Q. marmorata, especially “Tim Plowman”) which are handsome foliage plants even when not bearing their beautiful flowers. The bracts of Q. arvensis and Q. testudo are a fluorescent red. Quesnelias are indigenous to the rainforests of eastern Brazil. bright light and water in the tanks and potting medium. Pups are produced (often before the plant blooms) on stolons which are easily cut when the pups are to be potted up. typically a well defined, multi-layered rosette with many leaves or a narrow vertical tube of few leaves. Leaves edges armed with stiff teeth, quite vicious in the larger plants.Leaves stiff, acute or rounded at the end with a sharp tooth. Leaves are green and covered with trichomes (scales), sometimes banded on the undersides.The leaves of Q. marmorata are sprinkled with darker spots. held on a stem in the center of the rosette. May be a loose cluster of flowers or a tight cylindrical or conical head. Q. lateralis also may develop an inflorescence on the side (hence the name lateralis) of the main flowering shoot. 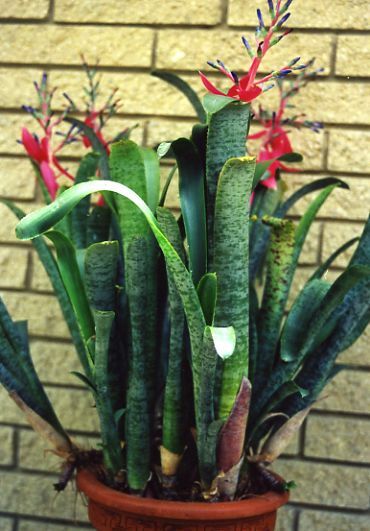 This is actually an additional blooming shoot with very small leaves, but unusual for a bromeliad. Tillandsia xerographica may also produce such an occasional flowering shoot after its regular flowering. FLOWERS: red, violet, blue, nearly black (Q. liboniana).